Sandy and Nice and Hot. The water is nice and cool. Luce slipped her shoes of as the neared the beach. She sighed happily as the sand flooded between her toes. Running towards the wader, she ran in until it was up to her knees. "Come on in Chris!" she called. Chris removed his snadlas and padded up to the waters edge. He hated swimming with his shirt on. He removed the top shirt and remained in his undershirt. He leaped into the water, with a happy leap. He remained submerged a bit before coming up on Luce's other side. "Wow this is amazing!" Floating on his back he watched everything, his eyes glittering with interest. This could easily be his favorite place. Luce grinned. "Yeah, pretty amazing." She dove under the water, glad she had been planning on going swimming later anyway and had worn ber bathing suit on underneath her clothes. Surfacing, she bobbed in the water for awhile before floating on her back. 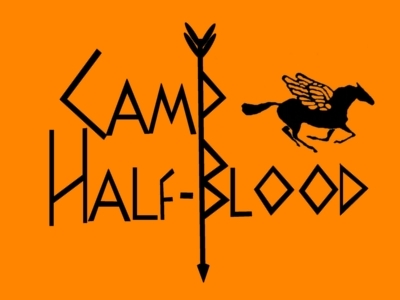 "Whats your favorite part of Camp Half Blood?" she asked, watching the clouds. Chris splashed some water around for fun while thinking. "Well so far its gotta be this place. The loft was evil." He winked and turned over, enjoying the coolness of the water on his skin. He smiled and tried to stand in the water. "Yeah, well. If you had been kinder to the loft it would have been kinder to you." She pushed some water over her face and sighed happily. "This place is one of my favorites too. Especially at night, when your supposed to be indoors." Chris chuckled, "Ah so your a rebellious one." He laughed and swam around a bit before coming to a stop by her. "Sounds like fun to be sneaky. I always tried it at home but my dad seemed to have the ears of a hawk." He chuckled, yet a darkness spread over his face which was quickly replaced as he gently splashed Luce. "Well, its hard here too, but a whole more fun." She laughed and splashed chris back, before diving under water. Surfacing, she laughed. "Betcha cant catch me." She took of through the water, her heair coming out of her pony tail. Chris accepted her challenge with a sly smirk. The large male was soon hidden by the water, he swam under it holding his breath as long as he could. Her sillouette lied perfectly against the water, he smiled and came up beneath her pushing up on her a bit, and coming out gasping for breath. Luce gasped with surprise as Chris caught up to her. Stopping to catch her breath, she laughed. "OK, your the first one to catch me in such a short time. Kudos to you." She swam until she reached shallow water, and was able to stand. Glancing around, she realised the were pretty far away from camp. "We should head back," she commented. Chris laughed, "That's because no one else is me." He swam backwards toward the shore. "I guess so." There was obvious disappointment on his face but he gave one last splash onto Luce before clambering out of the water. He slowly walked toward his shirt, a bit tired form the swimming. He reached down for his shirt and was about to put it on when he noticed an eight legged creature, a spider. Chris' eyes widened and he let out a sort of yelp and scream and he took off the shirt as fast as he could running back towards the water. The young male jumped back in and stayed there, his breath short and fast. Chris was deadly scared of arachnids, he always had been. There was no explanation to it, he just was. He stayed there in the water as far away from the monstrous beast as he could. He shivered in both cold and fear. Luce laughed and swam up to him, pushing her hair awy from her face. "What did you see that terrified you so?" she asked, her eyes sparkling. "I've never seen anyone move that fast before." Chris spoke his voice shaky and hinted with nothing but fear. His voice was rapid as he spoke of it, "It was this big ugly spider, it was all over my shirt. It was disgusting and all of its digusting and cruel eyes were on me. I could have died!" He swam back a bit, not wanting to get any nearer. Luce burst out laughing, but grew somber. "Beware the spider, dundundunnnn," she said in a mock scary voice. She put a hand on his shoulder. "No worries though. I'm deathly afraid of moths." She whispered the last word. "But don't tell anyone, they would make fun of me for years." Chris looked at her, his eyes narrowed. He was about to retort when she told him she was afraid of moths. "Ooo the moth dundundun." He smiled and said, "We are even, c'mon. I'm getting cold." He stepped out and made his way slowly to his blue shirt. The spider had gone and he picked it up with a sigh. "Thank goodness." Luce followed him out of the water, shivering. Pulling on her clothes, she turned to Chris. "Want to go see how Erin's doing at the big house?" She shivered, the water chilling. Chris nodded, shivering and picking up his shirt. "Sure race ya there!" He grinned and ran off, stumbling here and there. Luce narrowed her eyes and sprinted after him, a laugh bubbling from her. She stuck her arms straight out from her sides, feeling the drag slow her down. Keeping her eyes on the prize, she ran towards the Big house.